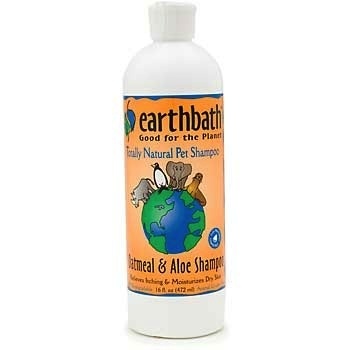 A Natural Approach Earthbath specially formulated this Oatmeal & Aloe itch relief shampoo to address the needs of beloved pets with dry, itchy skin. Oatmeal and aloe vera are recommended by veterinarians to effectively combat skin irritation, promote healing, and re-moisturize sensitive, dry skin. This luxurious shampoo is all natural, soap free and pH-balanced to clean and deodorize safely and thoroughly, leaving your pet's coat and skin brilliantly clean, soft, plush and smelling better than ever before. Will not wash off topical flea applications. Safe for all animals over 6 weeks. Soap free. Ingredients: Purified water, renewable coconut-based cleansers, colloidal oatmeal (3%), aloe vera, almond and vanilla essences, olive oil squalene (natural preservative). All ingredients are natural, 100% biodegradable and extra gentle on your pet & you. This product contains no: parabens, phosphates, pthalates, DEA, synthetic dyes or perfumes. Any residue left behind is completely safe and will not harm your pet.